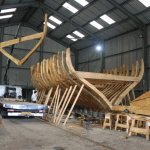 Cornwall Marine Network is delighted to announce that it has secured further funding to help preserve maritime heritage skills. The ‘Interreg IVA Two Seas’ funding programme will support the bringing together of two previously funded projects: Traditional Maritime Skills and Heroes 2 Seas. 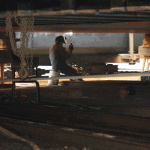 …now named Maritime Heritage Skills: Preserve, Develop, Share. 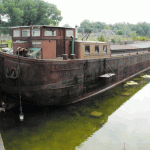 The laborious process of restoring Holland’s longest Dutch wooden boeier yacht is being monitored to help preserve century-old skills. The round-bottomed Vabel yacht is being rebuilt to her former glory plank by plank in order to conserve an important part of Dutch maritime history. Cornish wooden boatbuilder Marcus Lewis has unveiled his beautiful Mayflower dinghy, built under the gaze of the TMS project’s cameras and which marking the revival of a classic gunter rigged design. 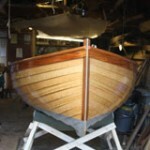 The newly-built 14ft dinghy will be unveiled at the Southampton Boatshow’s Wooden Boatbuilders Association stand. 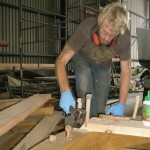 Skills used to maintain the historic tall ship Mercator in Belgium have been documented as part of an important educational resource for future traditional boat builders. The beautiful vessel is maintained as a sailing ship museum in Oostende and on-going conservation work to preserve the 78.5 meter barkentine is carried out by a dedicated team of volunteers. 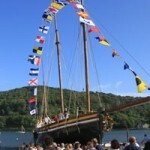 A young couple from Cornwall have just launched the largest wooden lugger built for 200 years. Detailed recordings were made of the traditional skills used to build the three-masted 108ft traditional lugger, called Grayhound. 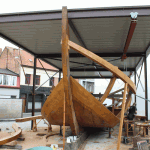 A valuable online tool, packaged with a wealth of traditional boatbuilding educational resources, will be launched at next month’s conference in Belgium. The free and comprehensive virtual learning environment has been created to deliver detailed course frameworks covering a host of traditional skills such as riveting, splicing, rigging, laminating and sewing sails. 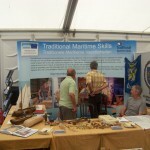 Over this weekend (24th & 25th August 2012) Niek Peters attended the Maritime Days in Vlissingen, sharing a stand with Stichting Behoud Hoogaars to promote the traditional skills that are used by boatbuilders. 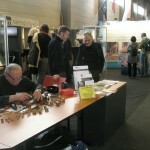 The 13th edition of Ostend at Anchor was a hit! An estimated 250,000 people in Ostend the 13th edition of the maritime festival “Ostend at Anchor” attended. Spread over four days – from 25 to 28 May – visitors could take a 150 classic sailing ships that were docked in admiring the harbor. This year’s theme was “in Ostend at Anchor Steam”, with special attention to steamships and machinery. 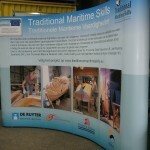 Also on this great maritime event we had a promotional stand of the Interreg project “Traditional Maritime Skills”. Three days celebrated the association Tolerant Rupelmonde in the construction of new piers in the river Scheldt. The pilot allowed the construction of the stallion Pegasus be viewed and had an exhibition of the Belgian Marine Painters site. Friday night, went well with great interest in the presentation of the new book by employee Werner Van de Walle: “Mercator and the Belgian school ship” by. 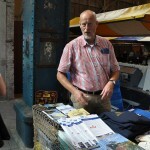 Another was the promotion of the Interreg project “Traditional Maritime Skills”. 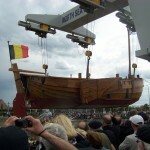 On 30 April 2012 the organization De Scute in Blankenberge re-launched the legendary Blankenbergse barge St. Peter which was restored by volunteers of the association. The Scute was rebuilt from 1992 to 1999, as a monument to remind us that Blankenberge until the 19th century was a fishing community. But in the 19th century the Blankenbergse population were no longer dependent on fishing for their income, the tourist industry soon took over. The many boats that always lain on the beach because Blankenberge had no harbor, were now cleared to make space for beach-huts. The B1 St. Peter has been a sought after attraction at historic ship events for 5 years. 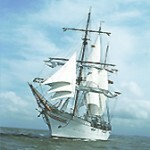 Her last trip was Sail Amsterdam in 2005. Then there was need for an urgent and thorough renovation. 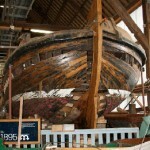 The elm boards of the hull were completely broken due to the famous elm disease. It was a very heavy and expensive process for the voluntary association of shipbuilders, The Scute. They replaced all of the elm and oak planks during the five years of voluntary work, the result can be seen. This was a well-attended promotional launch of the Interreg project “Traditional Maritime Skills”. With the disappearance of maritime professions into oblivion. 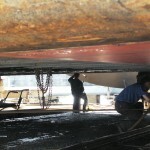 Do you have the skills that all shipbuilders should have..? 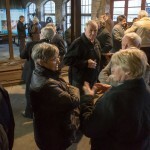 The Shipyards Baasrode, the site for excellence in maritime heritage in Flanders, had on Saturday March 31 the opening of the new museum season. 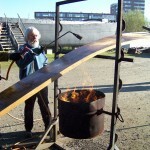 The historical boatyard in Van Praet (where until 1986 iron ships were built and restored) promoted the Interreg project “Traditional Maritime Skills”. The many attendees showed a lot of interest there for the stand to remain there for the following weeks. Over 6 days the exhibition halls of Flanders Expo in Ghent was host to the 24th Belgian Boat Show. Which was attended by more than 26 000 interested parties. Hall 4 had Monumentenwacht Heritage Afloat, a stand which includes a whole section reserved for the promotion of the Interreg project “Traditional Maritime Skills”. A special “pop-up” showed where the project is about. The project was explained to many visitors and they had an interesting brochure to take home. Baasrode – The location of the former Naval Van-Damme and Van Praet-Dansaert was legally protected in 1993 as a village view with five monuments. Today sounds again the robust sound of traditional tools, and it looks real enthusiastic volunteers build ships. Ambrosuis (Broos) Colman explains why exactly Monumentenwacht Heritage Afloat at this place descended. He explained the activities of the organization and its employees. The so-called 2 Seas area (English Channel and the southern part of the North Sea), has launched a European Inerreg programme that includes northern France (Nord-Pas de Calais), Flanders and Zealand on this side of the Channel and the entire southern coastal area of Great Britain, from Cornwall to Norfolk on the other side. Historically, the 2 Seas region is a major contribution to the economy and society of the regions along its coastline. As a result, a long maritime history of working together and trading skills were formed.